Two psychiatrists at a Texas state hospital have resigned after being told they would face disciplinary actions for accepting hundreds of thousands of dollars in speaking and consulting fees from AstraZeneca AZN +1.58% while also promoting one of its drugs to state officials, according to a spokeswoman for the Texas Department of State Health Services. 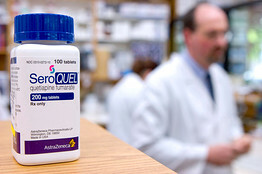 The psychiatrists allegedly violated various department rules as a result of their relationship to the drug maker, which involved efforts to ensure the Seroquel XR antipsychotic would be placed on the state formulary and prescribed by state physicians, according to letters sent to the physicians by the department. A formulary is a list of preferred drugs for which insurance coverage is made. The physicians were investigated in conjunction with a lawsuit that was filed last October by the Texas Attorney General, a department spokeswoman writes us. The Attorney General alleged AstraZeneca illegally marketed its Seroquel antipsychotic for unapproved uses, paid kickbacks to physician and state health officials, and subsequently caused the state Medicaid program to overpay for the medicine. The lawsuit notes that people with schizophrenia or bipolar disorder were more likely to be uninsured and not able to afford Seroquel, therefore relying on state health programs, according to an earlier report on this matter. As a result, AstraZeneca anticipated a “significant portion” of its revenue would come from “public sector” payers, according to the lawsuit. As noted previously, that lawsuit built on claims in other lawsuits that were filed by two former AstraZeneca sales reps, who alleged the drug maker used various tactics to induce doctors to prescribe different versions of the Seroquel pill. The allegations mirror charges of off-label marketing of Seroquel that led AstraZeneca to pay $520 million six years ago as part of a settlement with the U.S. Department of Justice. Texas officials say that one psychiatrist, Lisa Perdue, was paid more than $615,000 by the drug maker between 2005 and 2013, and allegedly approached members of the state’s Executive Formulary Committee, although did not disclose she did work for AstraZeneca, according to department documents. And Anthony Claxton received more than $231,000 between 2005 and 2012, according to department documents. Neither psychiatrist could be reached for comment about the resignations. In an e-mailsent to state officials last week, Claxton acknowledged presenting Seroquel information to other state physicians, but maintained he believed he had supervisory permission. An attorney for Perdue did not respond to messages seeking comment about the resignation. A department spokeswoman tells us that Seroquel XR was never added to the state formulary, but that the older version of the drug has been on the state formulary since at least 2004. She adds that there were no issues surrounding patient care. Both psychiatrists worked at Terrell State Hospital, which is one of 10 psychiatric hospitals run by the Department of State Health Services.